Every once in a while, an idea comes along which is so simple and effective, you wonder why you didn’t think of it years ago. Who among us has not experienced the frustration of trying to untangle the spaghetti of power leads, flexes and other wires which seems to spontaneously accumulate behind electrical appliances? Or, how many times have you reached to unplug a table lamp, only to see the television go blank? Or perhaps you return to a puddle on the floor in front of the freezer, when you thought you unplugged the kettle? In the workplace, getting plugs mixed up can have even more serious consequences. None of us would want to cut off a colleague’s computer when they were dealing with important data. Even more pertinently, cutting off the supply to a piece of machinery at the wrong time could cause it to malfunction, representing a health and safety risk. Also, in a work environment where the maintenance of the electrical systems within the building may be shared between several individuals of even companies, inadvertently pulling the wrong plug could lead to a very serious hazard. Plug labels are the simple solution to all these problems. Just as equipment labels on workplace appliances instruct us on safe use of the product, similarly electrical plug labels can prevent each of us from making a simple mistake with serious consequences. The simple solutions are often the best, and in this case the solution is extremely affordable too. Label Bar are an online retailer of labels and stickers of all kinds, including PAT testing labels, health and safety signage, packing and shipping labels, and plug top marking labels. While many of the products we supply are to allow employers to meet their legal responsibilities, or are specifically designed for use in the workplace, stickers for plug tops work just as well in the home or anywhere else where appliances run off the mains electrical supply. How would you use your labels for plug tops? Marking the plug of your desktop PC would hopefully prevent anyone from disconnecting it while you are working on an important document. Meanwhile, fixing one to your laptop lead will stop it from being removed by mistake. One very specific application for plug top marking stickers is to notify electrical engineers, or anyone else conducting maintenance, of the properties of the plug and the device it’s connected to. That’s why we produce amp plug top marking labels which are marked with different ampages to signify the rating of the fuse which is fitted within the plug. 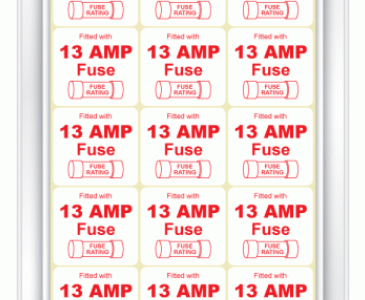 Amp plug top labels can help an electrical engineer to find a problem quickly in the case of a power failure. They also remove any chance of someone accidently fitting an appliance with the wrong fuse. Other plug top labels which fall into this category include double insulator labels, earth symbol labels and clean power supply labels. All of these stickers can help electricians working on your facilities and make life more convenient for your workforce.